Whether you are at home or on the go, you need a water filter that is as active as you are. Imagine being able to filter water at the pace of your faucet anywhere and into any container that works best for your hectic schedule. Now, Whirlpool® Water offers fresh filtered water at the speed of life™ with the EveryDrop™ Water Filter. The EveryDrop™ Water Filter can filter one gallon in just two minutes, that’s five times faster than leading brand water filtration pitchers. Furthermore, the EveryDrop™ Water Filter has a capacity of 60 gallons, 50% more water with one single filter—that’s 20 extra gallons of purified water for you before you need to replace the filter! As an added bonus, with the filtering power of one EveryDrop™ Water Filter, you can save 450 plastic water bottles from the landfill. The large capacity micro contaminant filter reduces unpleasant chlorine taste and odor from your drinking water. Now, everyone anywhere can enjoy delicious, freshly-filtered water at the speed of life™. Make the choice to live well for yourself and provide it to your family and taste the difference in ‘every drop’ with the EveryDrop™ Water Filter. Using it is so simple, just place the EveryDrop filter over the container you would like to fill and pour water through it. 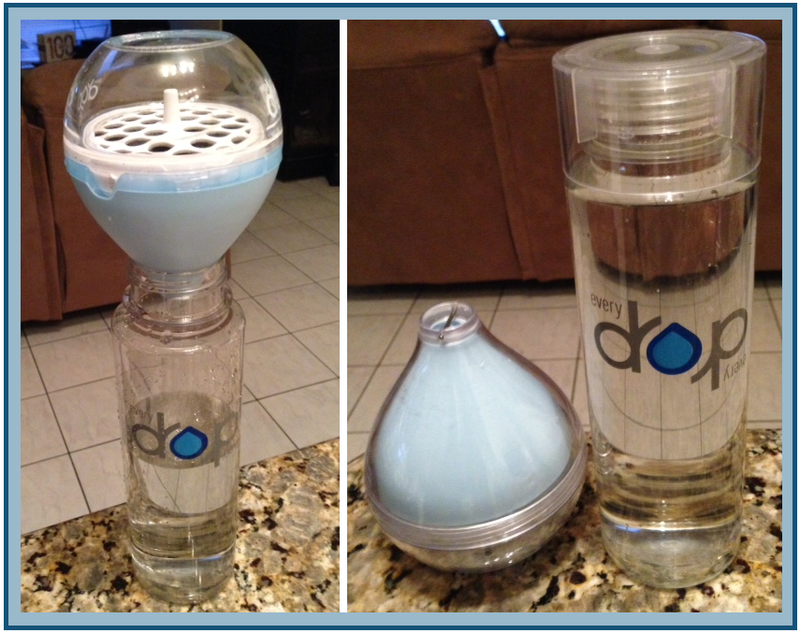 Once you are finished filling your container, just place the EveryDrop filter back into the travel case. One thing I really like is that there is an adjutable date on the side of the filter so you know to replace the filter after 2 months. The EveryDrop™ Water Filter starter kit includes, 1 EveryDrop™ Water Filter, 1 protective travel case, 1 micro contaminant replacement filter. It is available in blue or white for $19.99 at select retailers nationwide. 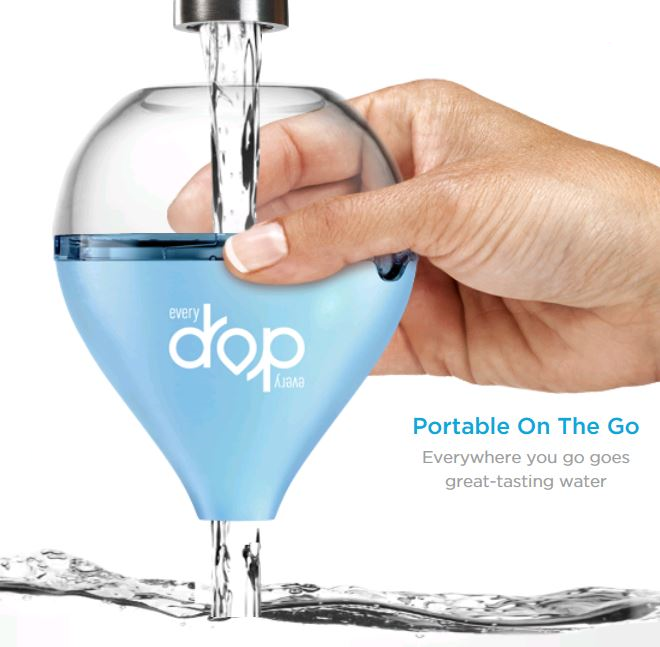 Discover the EveryDrop water filter at Everydropwater.com. 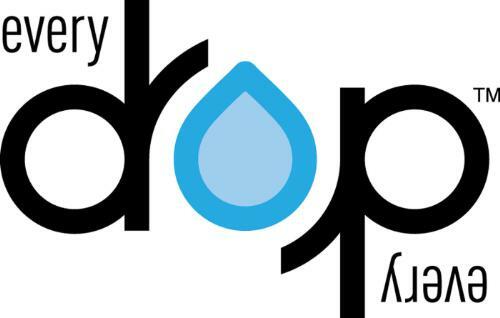 Find us on Facebook at “Like” EveryDropWater on Facebook and Follow EveryDropWater on Twitter. I haven’t bought this water filter yet but I would like to. I thought one of the reviews that I read I though you should know about that would definitey have me buy them as gifts also. The review said that they wished it had a control water flow valve. I like this idea and thought the company should know. This would help when trying to fill a water bottle from a fountain. Especially when your on the go all the time this way it can be filled brought over to a bottle and release the water. I normally call and offer my suggestions. I hope you go to amazon and read the reviews to improve your product. Thank you.